A card, letter or even a gift, can give a poorly child's face a much needed lift! Welcome to Post Pals, the charity helping you to ‘Post a Smile on a Sick Child’s Face’ by the sending of cards, letters, emails and little gifts to seriously ill children and their siblings in the UK. It couldn’t be easier for anyone of any age to get involved, requires no commitment and costs only a stamp and 5 minutes of your time. Click here to learn about how to get involved or browse through the stories of our amazing ‘Pals’ here, and if you would like to know how receiving a simple card can help a child through cancer treatment or transplant then we have some testimonials here. 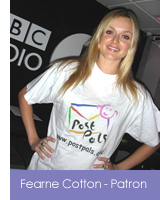 Post Pals – Winner of the Queens Award for Voluntary Services 2008, Readers Digest Hero of the year 2005, supported by Children in Need and Prince’s Trust, Patron Fearne Cotton.